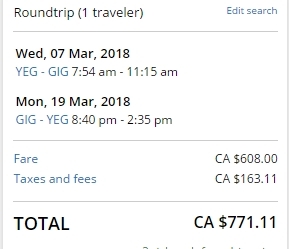 United Airlines has dropped the price of their flights from Edmonton to Rio de Janeiro and Sao Paulo, Brazil down to $846 CAD roundtrip including taxes. It pains me a bit to call this a great deal, considering there were flights to Brazil in the $600s to low $700s roundtrip back in 2015 / 2016. But flights to Brazil have just been *so* expensive for over a year now, and this is a pretty significant price drop. The flights have 1 stop each way, in Houston. NOTE: Canadians require a visa to visit Brazil - although as of a few weeks ago, it's a lot easier to obtain one, and the price has dropped dramatically. - Look for the dates that are $869 roundtrip. - Try the same dates you found on Google Flights. TIP: After your Momondo search completes, select '1 stop' on the left hand side. 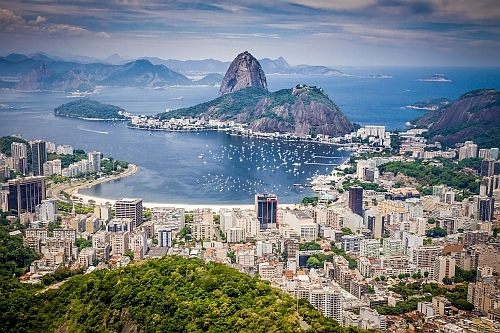 Update 2/12 - United Airlines is now showing flights from Edmonton to Rio de Janeiro and Sao Paulo, Brazil for $771 CAD roundtrip including taxes. edmonton, yeg, flight deals, south america, united airlines, sao paulo, brazil, gru, rio de janeiro, gig and sao.